Sony spent most of its CES conference celebrating all things 3D, and with good reason. The company's 3D portfolio is full to the brim of 3D goods – and this year the third dimension expanded to its camera, PC and camcorder line-up. The Sony HDR-TD10E 3D camcorder is one chunky beast. The chassis has a lot of extra width, due to the fact that Sony has to squeeze two lenses into the camcorder, each one recording 1080p footage. The camcorder's integrated dual lens system also means that Sony has had to double up on its Exmor R CMOS sensors, and there are also two BIONZ image processors on board. Sony is hoping that it will make 3D shooting as easy as shooting 2D video. This is something of a challenge, mainly due to the fact that you have to be more concerned with issues such focus and depth of field, as well as avoiding messy jolts and zooms in your footage. There's some interesting features to make shooting easier. These include a dual recording system that means the camcorder has the ability for 3D content to be played back in Full HD 2D automatically on non-3D displays. 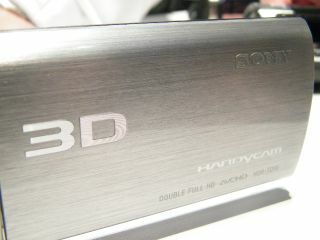 Although playback of the footage has to be on a 3D TV and through glasses, you can view your content on the camcorder. The 3D footage can be played back without glasses on the Xtra Fine 3.5-inch 3D LCD touchscreen. Other features include 10x optical zoom with Optical SteadyShot (Active Mode) and iAUTO are offered in 3D mode. Memory wise, 64GB of flash memory is on board which makes the HDR-TD10E an enticing product when it is released in April 2011. We recommend you find yourself a pair of bigger hands first, though.